Size XS: Length - 5in, Width - 5in, Height - 2in. Size S: Length - 5.5in, Width - 5.7in, Height - 2.3in. Size M: Length - 6.5in, Width - 6.5in, Height - 2.5in. Size L: Length - 7.3in, Width -7.3in, Height - 2.7in. Size XL: Length - 8in, Width - 8in, Height - 3in. 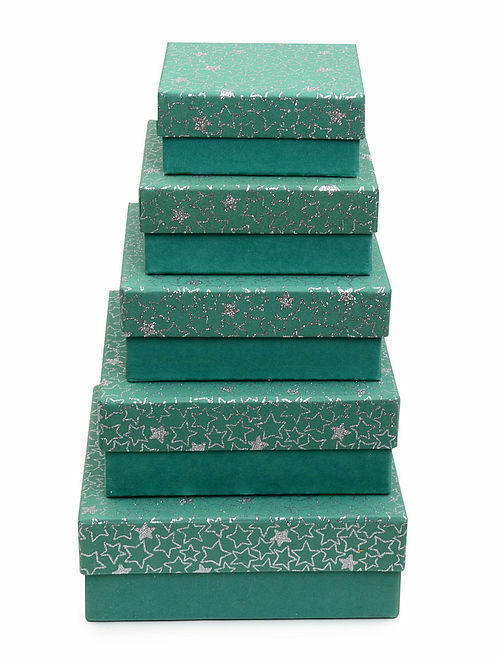 Note: The measurements given above are gift box measurements. This set of boxes by 'Xylem' with its vivid colors brings in a lovely pop of color and fun. A perfect dose of color to brighten up the corners of your home this festive season, use this for your own home or even as gifts for your loved ones. Dispatched in a maximum of 3 business days. Returns accepted within 10 days of delivery. Cancellation requests will be accepted strictly within 24 hours of placing the order only.